Like your favorite treats at any local summer festival stand, food seems to be more exciting when it’s served on a stick. 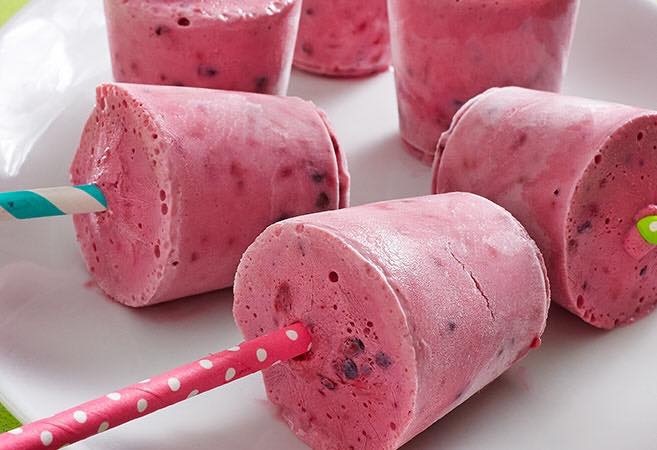 Think of this whimsical and chilly treat like a smoothie on a stick. If only there was a way to deep fry it…at least this recipe is much healthier than deep-fried ice cream candy bars. Process 2 containers (5.3 oz each) of vanilla Greek yogurt, 2 cups of frozen berries and 1 cup of milk in the Manual Food Processor until coarsely puréed. Pour into 12 (3-oz) paper cups and freeze until slightly set. Insert wooden sticks then freeze until solid. The Condition Of One’s Heart! The Everything skit link below never gets old….I’ve seen so many youth groups perform it, including ours from Bethel Baptist of Jonestown, Pink Hill. The Everything Skit and the song, “Not Far From Here” (below) are all the message one would need/should need for a full altar call in any church and/or youth/adult event. There’s so many worldly things/thoughts pulling the young and the old today: lust, depression, drugs/pills, alcohol, peers, ideology of “thinness”/look a particular way, beauty/ugliness, money, misuse of knives/guns, hatred, anger, violence, manipulation, lies, theft, bullying, control, and the list goes on and on. Anything or anyone who ANGERS YOU, CONTROLS YOU! The world needs peace, unity, and love! Not lust, but LOVE! AGAPE LOVE, is the LOVE that comes from God! Agape Love is the LOVE that’s needed! Until we as a community, state, nation, and a world unifies with LOVE, CHANGE will not come to its people. LOVE & MAKING A DIFFERENCE CAN BEGIN WITH JUST ONE PERSON, WITH ONESELF! Our churches are half full, and prayer has become a bandaid, rather than a vital part of everyday life. It’s hot outside, do you drink something cool once a day? Do you want only 5minutes of air conditioning? We need to get back to the basics: God, Country, Family, Community…. If we have God, we can with the help of others who know God, pull through the valleys as well as cheer from the mountaintops. ALL LIVES/ALL PEOPLE: “ALL LIVES” MATTER TO GOD AND SHOULD MATTER TO EACH OF US!!! There’s “good” and the “not so good” in everyone. WHICH PART ARE YOU GOING TO FEED? ALL Believers sin! The bible says so! ALL Nonbelievers sin and they OFTEN use sins of believers to accept the ideology that believers are no different than them/it’s a hypocritical way of life, so no thanks; I don’t need your God! We need to assemble together with others and pray. PRAY we believers will make a difference and others will come to know Christ. Sinning is also sins of omission! Things we should do! Don’t “forsake the Assembly of God” because of the short comings of believers-some believers never grow up-they stay as babes in Christ; some may not be where they need to be yet; or others don’t see their untactful behavior, being cliquish, or controlling selves. If we stay out of church, rather than in church praying for them and ourselves, to “tolerate” their shortcomings/personality traits as we ask for our own to be tolerated til we through HIM grow, love better, and be a better self than we were the day before -we don’t become part of the solution, we become part of the problem. In society, (communities, nation, jobs/careers/workplace, homes, families, schools, etc) it’s the same struggles. We all struggle “to be better than we were” yesterday. There are so many good people who are believers/unbelievers playing with worldly things/people. We need to pray for them to see the light, not the darkness the world offers. We need to pray for believers and unbelievers, that ALL see the light, not the darkness. “All of us fall short”! The bible says so. We are human and there’s not a perfect one anywhere. All have and will have differences of opinions; our makeups and personality are different. There will always be different opinions, those doing good and those doing bad, but we must “bind together in prayer” that the godly and love prevails! We must pray people see there is a difference in love/hate, peace/violence, unity/division. We must pray for those people who may not do horrific things, but they don’t do good things such as those who prey on the weaker ones/vessels and/or manipulate others to follow them as they use their money, titles, status, things they own, etc to control/manipulate others to meet their own goals. ALL People are people/part of humanity, who deserve to be treated with the same respect, love, compassion, and friendliness as you want to be treated. Does that mean we stand up and support illegal things such as trafficking, violence, drugs and thievery? Bullying, manipulation, lies, controlling individuals,etc? No, but it means we don’t and should not join them with more violence & bullying! We can agree that we will not always agree and we will have differences, but we do not have to use or feed the “tumors” of society such as violence, lies, half-truths which are lies, addictions, rumors, or minimize others publicly to make one feel superior to another. We need to pray for peace, love, and unity-not just once a month, once a week, or once a day. We must “pray without ceasing” for a change/light bulb moment/aha moment and a wake up call for those playing with/in the mud puddle of the worldly lusts/darkness. If you play in the mud puddles of the world or stand on the edge of such mud puddles, it splashes upon you. Playing with/joining peers just once or twice may be all it takes to be a part of a life that brings death-Death of a nation, community, church, family, and yes, DEATH Of AN INDIVIDUAL(S). Note: (everyone needs to understand a life taken cannot be brought back to life.) Don’t be fooled by your peers and/or the devil! satan will work his way into a family, church, or community til he can get just one crack. One crack is all he needs to destroy any of the above. Remember, wolves can appear clothed in sheep clothing. Pray for yourself, your families, your neighbors, churches, your communities, leaders, co-workers, children, teens, young adults, emergency responders of all areas of careers, those working in the media, government officials, and our nation. Pray for those who serve you, your communities, etc. and pray for all the volunteers in your communities. Media outlets would rather fill your minds with the negative and violence because that equals “high ratings” and high ratings equal job security, pay days, and their existence. People strive on the negative news. Let’s change to strive on positive news and good things of ALL PEOPLE/AREAS within our county. A recent two posts in my community- one about a suspicious vehicle/person versus a community nonprofit entity needing help to help others. The first got an overwhelming “WOW” number of shares and reached more than a thousand people. The second had a couple shares and reached a sad sad few people. If our churches, able people, and communities don’t stand up and be an active part of the solution displaying love, putting others before themselves, and volunteering even when it takes you from what you rather be doing/out of your comfort zone, our society and our communities do not and will not get better. They will get worse. For companies/business owners who offer money or employees to serve to meet community needs, thank you as that’s needed too! For businesses or individuals who are local to a community who do not participate personally in the hands on serving, you’re not really part of the solution. By not leading by example, not realizing the perception you’re giving off as being better or above others or/as your time is more precious than the others you send. “PRESENCE” is needed by others. Not one person is better than another. All people need respect, presence, and see ALL people working beside them, not above them. I believe this is exactly why there’s the stories/parables in the bible. The parables in the bible are to make it easier for we humans to understand. The real deal here is, we must pick up the bible to read it. It doesn’t matter if you’re a person with plenty or a person with little, each has the same amount of time-24 hours a day(1,440 minutes). What and how you spend it, is what puts you as being part of the solution or the problem as well as where your treasures lie. Look in your community to see how you can be a physical part of service/serving others. Volunteering, serving out of a godly heart, and your bodily presence serving the lives of those needing the service can never ever come with a price tag! The love and kindness shown blesses the giver as much as the recipient. It’s PRICELESS! The smiling face, warm heart and hands, “the presence” is worth more to the recipient than the actual need being met. People NEED People! “Peace not violence” and “selflessness not selfishness” starts with the condition of the heart! Everyone needs a heart checkup, everyday! Not one individual is exempt from needing a heart checkup.!!! The bible continually tells us we will never be where we need to be: WE “all fall short”! We need a checkup daily, and the man upstairs is always available! There’s no long lines, busy numbers, or voice mails. He’s waiting on us to contact HIM! PLEASE TAKE THE TIME TO WATCH THE SKIT AND LISTEN TO THE SONG!